Thanks to your feedback, Swimia has turn out to be in just many months one the most essential sites of swimming pools. Here you have all of the info we know about Condor Holiday Apartments, in Gold Coast. 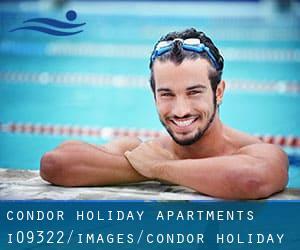 Don't forget you can also promote this pool so Condor Holiday Apartments will appear the very first of Gold Coast, or even the first of one's country, contact us to know much more. Swimmers like you reported 25 meters, Outdoors. Phone number and e-mail address are number for this Swimming Pool. Corner Esplanade & Elkhorn Avenue , Surfers Paradise , Gold Coast Metropolitan Area , QLD , AUSTRALIA (Postal Code: 4217). Among all of the activities provided by the centre, should you be interested in swimming you'll enjoy 18 meters, Outdoors. If you need to contact this Swimming Pool, e-mail address and phone number are both number. Updated on 2019 Pizzey Park , 80 Pacific Avenue , Miami , Gold Coast Metropolitan Area , QLD , AUSTRALIA (Postal Code: 4220). Few days ago a common user of this centre told us they offer Olympic size x 25 meters, 10 lanes, 1.1 meters - 2 meters depth, 1.1 meters - 2 meters depth, Outdoors. Furthermore, they keep in good conditions Olympic size, 8 lanes, 1.1 meters - 2.0 meters depth, 1.1 meters - 2.0 meters depth, Outdoors. For this Pool, only phone number is number here. School Street , Mudgeeraba , Gold Coast Metropolitan Area , QLD , AUSTRALIA (Postal Code: 4213). Swimmers like you reported 25 meters, 6 lanes, Outdoors. Unfortunately we do not have the e-mail address of this Swimming Pool, but we can provide you with the phone number. University Drive , Robina , Gold Coast Metropolitan Area , QLD , AUSTRALIA (Postal Code: 4229). Among all the activities provided by the centre, if you are thinking about swimming you may enjoy Olympic size x 23 meters, 8 lanes, 1.5 meters - 4 meters depth, 1.5 meters - 4 meters depth, Outdoors. Just in case you need to contact this Swimming Pool before dropping by, we only know the phone number. Updated on 2019 Ross St. , Ashmore , Gold Coast Metropolitan Area , QLD , AUSTRALIA (Postal Code: 4214). This sports centre provides 25 meters, 6 lanes, 1.1 meters-1.7 meters depth, 1.1 meters-1.7 meters depth, Indoors. Contact facts for this Pool including phone number and email address are number. Sea World Drive , Main Beach , Gold Coast Metropolitan Area , QLD , AUSTRALIA (Postal Code: 4217). Swimmers like you reported 25 meters, 6 lanes, Outdoors. Phone number and e-mail address are number for this Pool. Updated on 2019 3232 Surfers Paradise Boulevard , Surfers Paradise , Gold Coast Metropolitan Area , QLD , AUSTRALIA (Postal Code: 4217). Swimmers like you reported 25 meters, Indoors. Unfortunately we do not have the e-mail address of this Pool, but we can give you the phone number. Rugby Lane off Discovery Drive , Helensvale , Gold Coast Metropolitan Area , QLD , AUSTRALIA (Postal Code: 4212). Swimmers like you have reported 25 meters, 8 lanes, Outdoors. Also, you will find 20 meters learners pool, Outdoors. Just in case you would like to get in touch with this Swimming Pool before dropping by, we only know the phone number. 2685 Gold Coast Highway , Broadbeach , Gold Coast Metropolitan Area , QLD , AUSTRALIA (Postal Code: 4217). Swimmers like you reported 25 meters, Outdoors. Phone number and e-mail address are number for this Pool. Corporate Centre One Building , Corner of Bundall Road and Slater Avenue , Bundall , Gold Coast Metropolitan Area , QLD , AUSTRALIA (Postal Code: 4217). Swimmers like you reported 25 meters, 5 lanes, Outdoors. Unfortunately we do not have the email address of this Swimming Pool, but we can provide you with the phone number. Updated on 2019 Martin Street , Nerang , Gold Coast Metropolitan Area , QLD , AUSTRALIA (Postal Code: 4211). Swimmers like you have reported 25 meters, 10 lanes, Outdoors. Also, you will find 25 meters, 6 lanes, Outdoors. If you need to get in touch with this Pool, e-mail address and phone number are both number. Updated on 2019 Marine Parade , Southport , Gold Coast Metropolitan Area , QLD , AUSTRALIA (Postal Code: 4215). Few days ago a regular user of this centre told us they offer Olympic size x 25 meters, 8 lanes, 2 meters even-depth, 2 meters even-depth, Outdoors. Furthermore, they keep in good conditions 25 meters x 20 meters, 8 lanes, 1.3 meters depth, 1.3 meters depth, Outdoors. For this Swimming Pool, only phone number is number here.